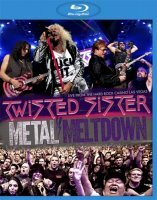 Twisted Sister's latest DVD release marks the band's 40th and, sadly, final year of live performances. 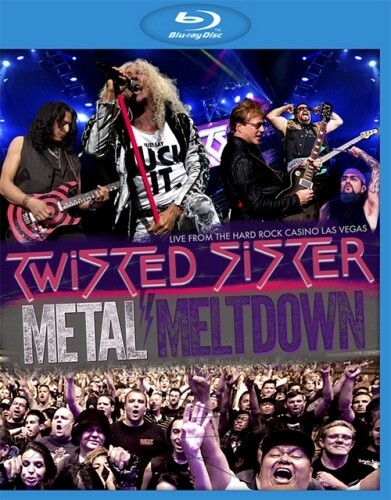 Twisted Sister's latest DVD release marks the band's 40th and, sadly, final year of live performances. 'Metal Meltdown' includes a concert filmed at the Hard Rock Casino (Las Vegas, May 2015) and a documentary on the band. The ninety minute documentary is pacey and suitably theatrical, full of Sin City-esque Noir cartoon depictions and chock full of memoirs, old photographs and interviews. From the concert footage, the band look in commanding form with Dee Snider resplendent in white against the black of the rest of the band. Snider has all the energy on stage that guitarist Jay Jay French lacks, jumping, fist-pumping and catching the camera at all the right moments. Interspersed with the live tracks is a potted history of the band. There's some edgy discussion between French and Bob Garvey over Snider's audition (or not) back in 1976-8, while former CEO of Atlantic Records, Jason Flom, describes the 'pandemonium' of TS in Poughkeepsie. The documentary runs on the easy humour of the band, evident in their side-glances, their comments on each other and their group warm-up in the lift at Las Vegas in the concert footage. The array of figures, from musicians to record label companies, ensures the DVD is insightful and fairly balanced, while including a few gossipy treats. Particular gems on the release include Mark Metcalf describing his experience as the actor in the 'I Wanna Rock' video and Scotti Hill (Skid Row) on being at the front in a TS gig – "that was my education man". Sadly, Twisted Sister's drummer, A.J. Pero, died of a heart attack two months before the footage was filmed. Ron "Bumblefoot" Thal speaks candidly but fondly about their friendship and Pero's musical talent. Mike Portnoy (Dream Theater, Adrenaline Mob) was Pero's selected replacement and gives a stellar performance as part of Twisted Sister. The band feature heavily in giving their thoughts on their history; getting signed was a "herculean effort" (Snider) and "part of what the band was about...overshadowed and destroyed the band" (Snider). The charting of their reunion features footage of the band performing together as the headline act at a 9/11 tribute concert in New York. The concert shows the band does not just go through the motions of playing their vast catalogue of hits, they really perform them. The documentary explores just how far the band has gone for their music, how expressive they have been and the impact they have made.